It’s been a big week for Apple, and following its media gathering at the newly opened Steve Jobs theater this past Tuesday, there is plenty to consider. The iPhones have understandably stolen the show but it would be a mistake to think that the iPhone X, iPhone 8 and iPhone 8 Plus are the only big announcements to have taken place. The new Apple Watch Series 3 has the potential to be just as big of a release as any of the new iPhones, and there is plenty to learn about the new wearable. 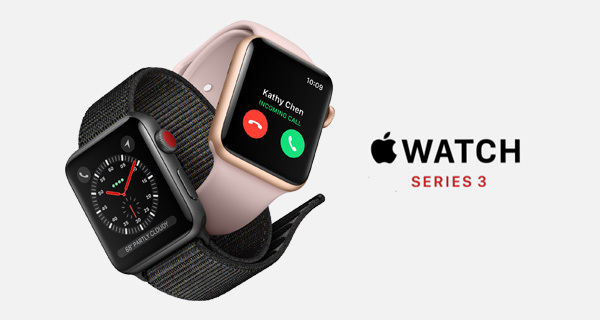 With so much going on during Tuesday’s event, it is easy to miss some of the details surrounding the Apple Watch Series 3, which is why we have gathered a few tidbits here for your perusal. Below you will find some of the smaller pieces of information relating to the watch that you may be unaware of, but are well worth knowing. Lets just jump in, shall we? Apple claims that the new LTE Apple Watch is capable of 18 hours of battery life (same as previous-gen and non-LTE models), which should be enough to get most people through a day of use. However, if you use LTE data heavily during the day, then expect that time to reduce. The 18 hours claimed by Apple is made up of 90 checks of the time, 90 notifications, 45 minutes of app use, and a 30-minute workout, which consists of music playback, and on the LTE model, it includes 4 hours of LTE connection and 14 hours of connection to iPhone via Bluetooth. As for phone call over LTE, the LTE model offers battery of up to 1 hour. It’s extended to 3 hour when done via a connected iPhone. Unfortunately, if you buy an LTE-capable Apple Watch Series 3, then it will not roam onto another network when taken outside of the country in which it was purchased. The reason given for this is that there’s only so many LTE bands support that Apple could embed into cellular antennas of a product this small. According to the T-Mobile’s initial fineprint for the Apple Watch Series 3, speeds of 512Kb/s were on offer, which is something much more akin to 3G than the blazing fast 4G speeds you may have been expecting. The company has since updated its policy to allow unlimited 4G LTE for the wearable. This may be obvious, but it does need mentioning: if you buy an LTE-capable Apple Watch Series 3, it does not need to be connected to an LTE service in order to function. If you want to use it as a normal, iPhone-tethered Apple Watch, you can, and can always switch on or off cellular plan on the Watch when needed. The GPS model will come with stainless steel body? T-Mobile’s new Band 71 isn’t supported on Apple Watch 3 LTE (nor on iPhone 8/X).